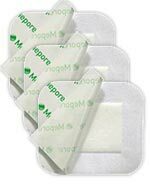 Molnlycke Mepore (2.5" by 3", part number 670800) is an easy to use, flexible, self-adherent absorbent dressing that works well on wounds with low to moderate amounts of exudate. Pack of 6 boxes (60 dressings per box). Molnlycke Mepore (2.5" by 3", part number 670800) is an easy to use, flexible, self-adherent absorbent dressing that works well on wounds with low to moderate amounts of exudate. Sold as a pack of 6 boxes (60 dressings per box).